This is the map for the 2016/2017 season. Changes this year have been made to Solon, North Libertty and Tiffin. See below the map. Please note, local changes may have occurred since this map was created. Our map is printed every 2 years so, there have been some changes. These are noted below. All trails are marked. Following the marked routes. There is now an intersection on the trail to Jersey’s at 76th Ave Drive SW. The trail heads east along 76th Ave Drive SW and Prairie School Road. At Jappa road it runs up to HWY 30. 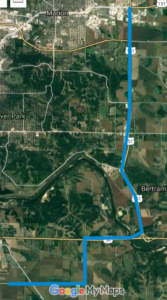 From HWY 30 it runs to HWY 13 and connects to Frozen Few trails in Marion at the intersection of HWY 151 and HWY 13. 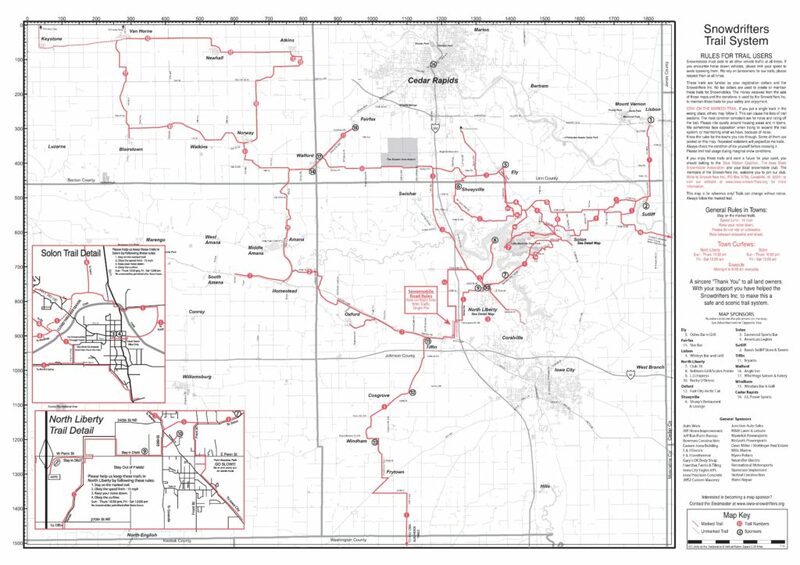 Iowa Code 321 G will apply to this trail along HWY 30 and HWY 13. 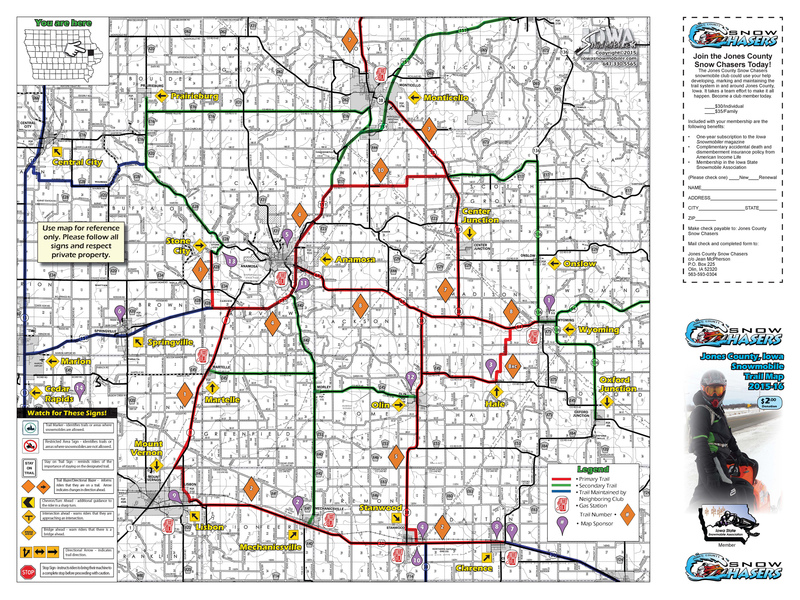 A snowmobile shall not be operated within the right-of-way of a primary highway between the hours of sunset and sunrise except on the right-hand side of the right-of-way and in the same direction as the motor vehicular traffic on the nearest lane of traveled portion of the right-of-way. Update 12/16/2016 Swisher is now accessible from the north side only. There is no gas but you can park behind the Squirrel Tap or walk a block to the Kava Houe. 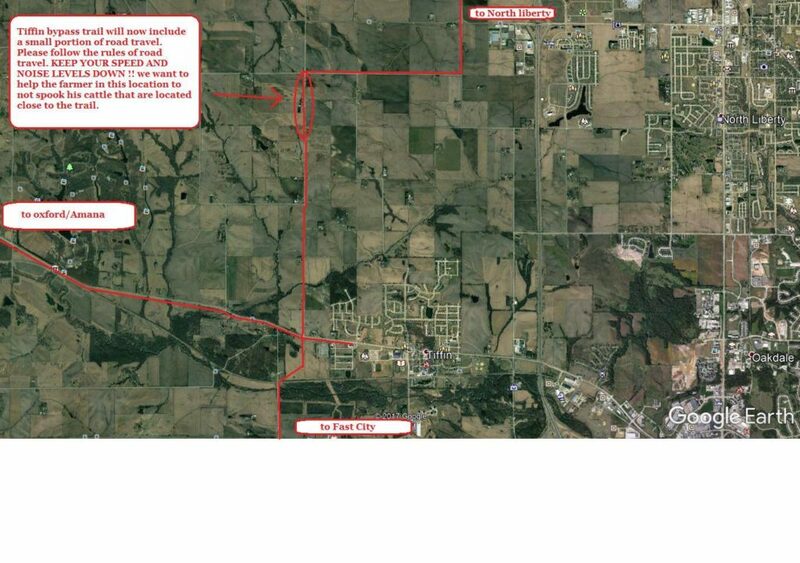 This is not showing on the map but is marked and permited by the new city ordinance. Marked 12/17/2016 Thank you Swisher. Update 12/15/2016 Tiffin changes not posted on map yet. Due to changes in middle of Tiffin it is not safe to ride through the middle of town. We recommend following the new yellow line route of the map below. Is was marked on 12/07/2016. 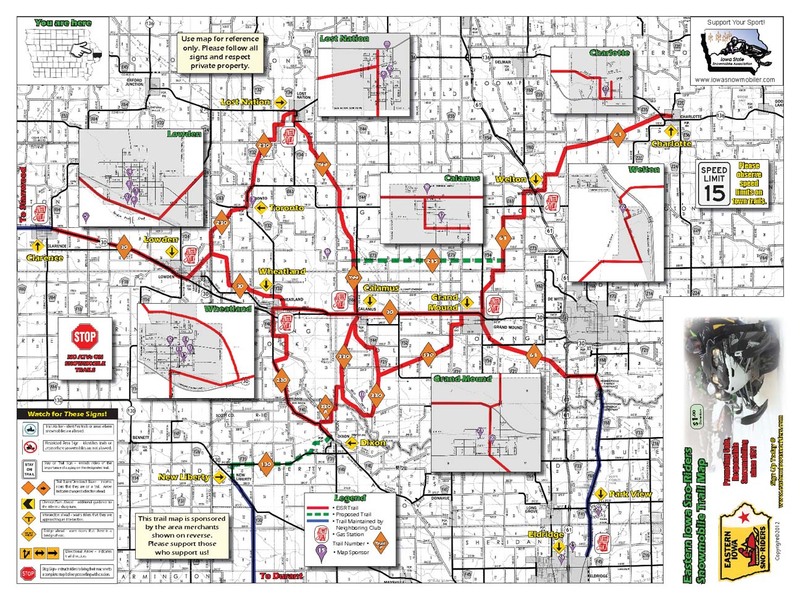 Update to CR trail 1/17/2016 . Note our signs on this trail keep getting stolen. If you see anyone stealing signs, please report it. The signs belong to the DNR and this is a crime. Maps for 15/16 are the 14/15 and are distributed. 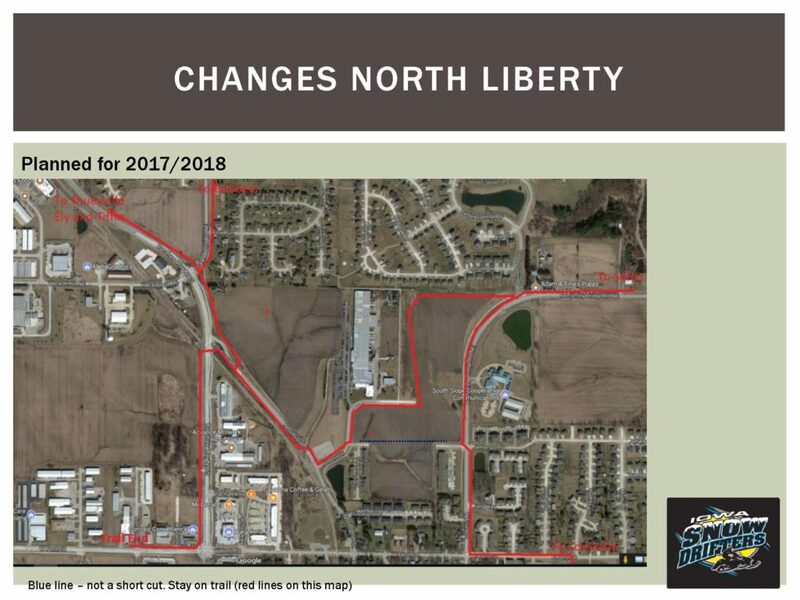 Maps are currently located at Club 76 (north of North Liberty), LD Express (North Liberty), Shuey’s, Good Time Charlies, Throttle Down, Bryant’s on 6th, Slims, Odies and others . 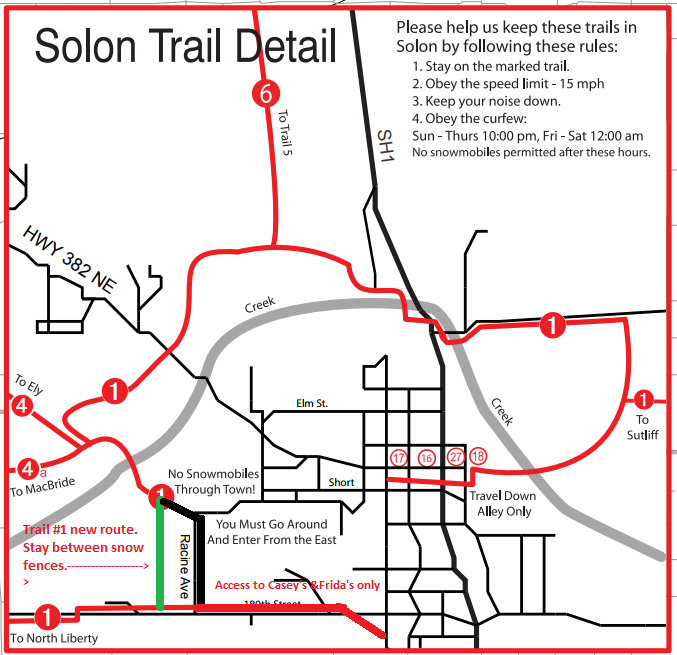 We are also working with Polaris Trails apps for your phone to keep our maps up to date. We have provided Polaris all our updates and it is up to them to load them into the mobile app. The Polaris app is still a little buggy and Polaris does not always update as we ask.